I was supposed to be a geologist. It’s true: I know a lot more about dips and strikes, mass extinctions, the relative time scale (which I can recite thanks to the mnemonic “Please come over some day, maybe play poker, three jacks cover two queens” — look it up), dissolved oxygen, schist, gneiss, basalt pillow formations and various dramatic fault lines than I do about the current New York Times bestsellers list, or what’s trending on Twitter. I’m an editor, but I still spend a lot of time thinking about rocks. And water. Actually, saying I was supposed to be a geologist isn’t quite right: I was supposed to be a limnologist, an expert in fresh water. This was thanks to a required science course in college, which sent me my first day of freshman year to Physical Geology and Dr. John Thomas, a tiny bald man with bad teeth who, for some reason, encouraged me to consider geology as a major. I had no better idea, and so signed up for the next class: Historical geology (i.e., fossils). 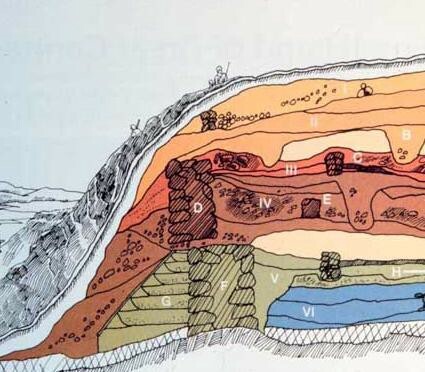 Then: Mineralogy, Crystallography and Stratigraphy. I got a part time job using a bandsaw to cut rocks into pieces, and received a grant to do a study of the kidney-shaped Lake Lonely, upstate, during my sophomore summer. I spent a semester away from school not screwing my way across Europe, but sailing a two-masted schooner so far from land that stars actually looked like stars and the weather was so treacherous that I once had to be chained to a mast so as not to go overboard. None of this means I learned survival skills; I wasn’t a geologist/hippie hybrid with a desire to live off the land, but a misfit who felt more comfortable floating in a fishing boat with her awkward middle-aged professor (not Dr. T, but another one), searching for life in a tiny, lonely lake than hanging out at the Icehouse, an awful bar in Saratoga Springs. I didn’t “collect” the high peaks of the Adirondacks; I didn’t dream of following Darwin’s footsteps in Patagonia. I certainly never camped. But I did learn how to imagine what the earth looked like without people: so much water and bizarre looking creatures with harsh, un-pet-like names. And, from sailing, and sitting up in the middle of the night on watch searching for pirate ships that would never materialize, I learned what it would feel like to be forgotten. Weirdly, neither of those things — a world without people, or being forgotten — scare me too much; I don’t much like aging, but I don’t carry around much angst about death. The end of the world, as it exists in pop culture, is a science experiment instead of a horror show. I think I feel this way because when you study geology you accept that we humans are just another bunch of trilobites, inevitably if slowly headed for a mass extinction, and that the earth is more powerful than Fox News or any other monster we can create. We may ruin the atmosphere, but people still can’t make weather. Hillary Frey is on slow-time.